ACTION COMICS is soon to be the very first comic book to ever hit 1,000 issues. Much like Superman bounding into existence as the first superhero, his own book will be the first comic of its kind. To celebrate this momentous occasion, I’ve put together a list of my ten must-read issues of Action Comics. With so many issues to choose from, this was not an easy thing to do. Luckily, I was helped by my own collection of Action Comics. A couple of years ago, with Action Comics #1000 on the horizon, I set a goal for myself to collect and own every issue of Action Comics. Currently, I have about 350 of the total 1,000 issues, but my quest, much like Superman’s will never end! My first must-read issue of Action Comics is issue #5. Now, I know what you’re thinking, “How could you not include ACTION COMICS #1? The issue that changed all of comics!? !” It was a tough decision but after careful deliberation I felt that the first issue doesn’t make the cut. Once you get past the iconic image on the cover of issue #1, the Superman that you meet inside is brash, bold and meaner than the Superman we know. That’s not a terrible thing, just further removed from the champion of justice that we recognize. The imagery in Action Comics #1 tends to be what we remember from that first issue. Superman lifting the car over his head, frightening Miss Lane during his first appearance and leaping between buildings. To get to the first instance where Superman transcends this initial persona, I present to you ACTION COMICS #5. It’s an issue with many Superman story beats, visuals and moments that have now become iconic. Superman does not appear on the cover of Action Comics #5. Back in the Golden Age of comics, titles like Action featured many characters and were considered anthology titles. Along with Superman, this issue includes other characters like Chuck Dawson, Pep Morgan and Zatara. But it’s the Last Son of Krypton’s story that puts it into the category of must read. “The Big Scoop” might seem simple to many experienced comic book readers, but for the comic fans of the 1930s, it was brash and bold. Here is a hero that leaps out into the night to stop the elements of nature with his bare hands! This story features many Superman elements and tropes for the very first time; elements that Superman fans now take for granted. Plus, the character of Lois Lane bursts into this story so fully formed that it makes Siegel and Shuster seem to look like visionaries. For modern audiences, the treatment of Lois Lane in this early appearance might come off as offensive. Lois demands to report the story about the Valleyho Dam that is about to burst. Her nameless editor at the Daily Star shouts back at her, “This is no job for a girl!” Thankfully, Lois ignores her editor, tricks Clark Kent so he won’t scoop her on the story and jumps on a train that is headed for danger. For a story published in 1938, Lois acts almost exactly as she does today. She won’t let anyone tell her what to do and takes matters into her own hands. It’s an impressive feat of writing that Lois is this distinct only five issues after her creation. The story also features another classic Superman story beat, the Superman/Lois Lane romance. Towards the end of this story, Lois is so taken aback by the power and presence of Superman that she kisses him. She remarks how she’s no longer afraid of him (a reference to that panel in ACTION COMICS #1.) Superman and Lois Lane’s relationship would evolve over the next 80 years, leading to their current marriage and child, but it’s refreshing to see the beginning when these two luminaries of comics barely know each other. Nowadays, Superman’s amazing feats aren’t surprising anymore. But in Action Comics #5, the Man of Steel moves a bridge to save an oncoming train. He stops a dam from bursting with his bare hands. Finally, he swoops in to save Lois Lane from the onslaught of water in a scene very reminiscent of Christopher Reeve’s first Superman movie. I would find it very surprising to learn the producers of that movie never read this issue. For all those reasons, Action Comics #5 makes my list of the ten must-read issues of Action Comics. Many modern readers might check out this comic and deem it to be too simple. To all of them, I say just because a story is simple does not mean it doesn't have power. The simplicity of this issue lends itself to becoming iconic for several reasons. Right out of the gate, Superman’s supporting cast is strong. From the feisty editor, to Lois’s insistence on getting the story herself, these mortal characters are as distinct and as powerful as the Man of Steel himself. The romance between the two main characters in the Superman saga starts here and it endures. Also, don’t forget about the several superhuman feats that Superman completes in this issue. Of all of Superman’s early adventures, this is the first issue that seems like modern Superman. Superman doesn’t simply sweep Lois Lane off her feet in this issue, he carries the audience away with him as well. If you’re looking to explore the legacy of Action Comics and the stories of Superman, Action Comics #5 is your first must read. 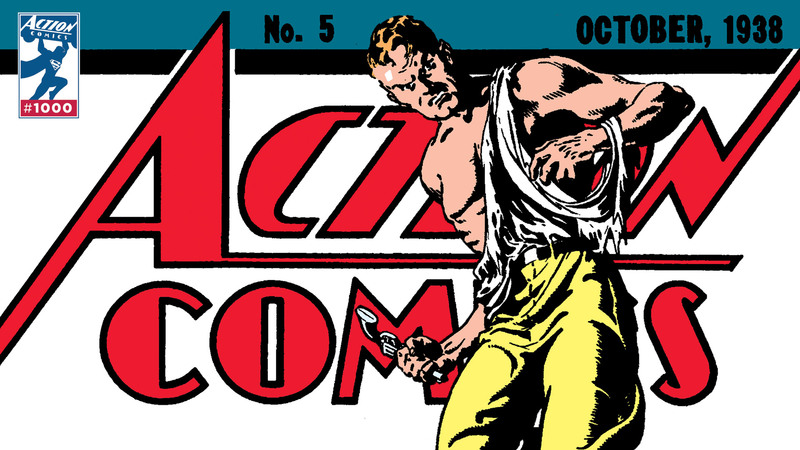 ACTION COMICS #5 by Jerry Siegel and Joe Shuster is readily available as a digital download.